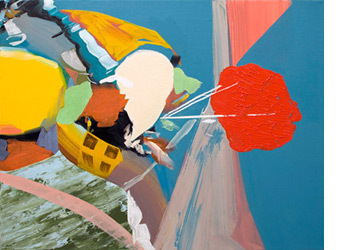 Jim Gaylord, ''Welkin,'' 2012, oil on canvas; 17 x 22''. In Jean Cocteau’s film "Orpheus" the hero-artist listens to cryptic radio messages that amount to Surrealist poetry — an idea deriving from coded messages sent to Resistance fighters during World War II. The media are a fertile source of imagery, even if we decide to create our own meanings rather than decode the senders’. Jim Gaylord takes still photographs from television programs and movie DVDs and chooses those he finds to be most visually interesting — often the least intelligible dissolves and tracking shots — as elements for his oil paintings and gouache-on-paper collages. Ten of these media-jacking works comprise "Skipping Over Damaged Area," the title referring to the evasive action taken by DVD players on encountering dirty or damaged disks. Gaylord superimposes the photos in the computer, obliterating the real-world referents, thereby liberating color and form, and creating, in the words of catalogue essayist Joseph Akel, “seismic landscapes that vacillate between the tightly ordered and the precipitously chaotic [in which] intricate honeycombs, matrices, and vectored pathways negotiate a tectonic terrain of floating fields and fractured forms.” The results are abstract, but elusively suggestive. Small oils like "High Muck-a-muck" and "Unknown Error" depict a shallow space of colliding planes and painterly gestures that suggest Kandinsky and Rosenquist — two painters not often associated. When the marks and forms relate, the result is satisfying; but the brushwork occasionally looks disconnected. Gaylord’s collages are more successful because of the tension between digital randomness and analogue method. "Coat of Arms," "Victory Lap" and "Greenscreen" are little universes in which control and chaos are balanced to perfection, each generating its opposite.